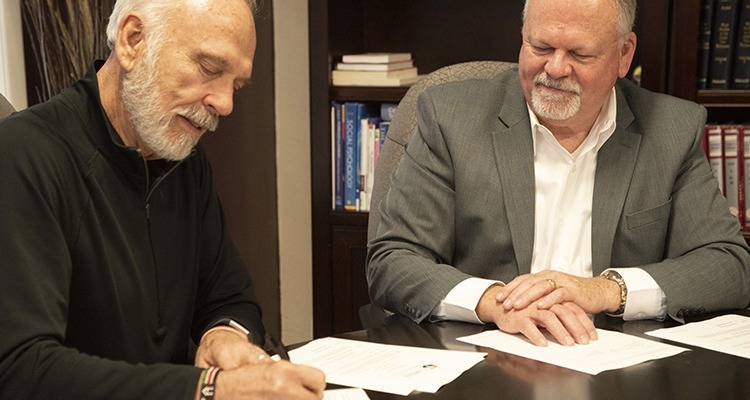 On Thursday, March 21, 2019, Corban University signed the official contract with Paid in Full Oregon (PIFO), a significant step toward offering an accredited bachelor’s degree for individuals incarcerated at the Oregon State Correctional Institution (OSCI). Present were Judge Tom Kohl, founder and director of PIFO, and Dr. Mike Patterson, Provost of Corban University. “This is an amazing day,” Judge Kohl said, noting that this has been a four-year journey for him. In 2017, Judge Kohl founded Paid in Full Oregon, a nonprofit organization designed to give inmates a quality education, spiritual mentorship, and the ability to become mentors and leaders throughout the prison system while they serve the remainder of their sentence. PIFO is modeled after other programs which have proven extremely successful in Louisiana, Texas, Georgia, and other states and have demonstrated the kind of restoration Kohl hopes to bring to Oregon. In order to be effective, PIFO needed to collaborate closely with both the prison system and an educational institution. Quickly, the pieces fell into place. OSCI offered to provide the space needed for the educational program, Corban University came alongside PIFO to provide accreditation, curriculum, and faculty, and PIFO served as a liaison of sorts between the two organizations, providing the fundraising efforts needed to renovate the classroom space. The majority of necessary funds have been raised, quicker than anyone expected. “Fundraising can take years, it can take months, or it can take weeks. In this case, it’s felt more like weeks,” Judge Kohl said. If all goes according to plan, they’ll be able to begin the two-month renovation process in June, allowing the first cohort of 25 students to begin instruction in September of this year. Students will spend four years completing a bachelor’s degree in Liberal Arts (with an emphasis in psychology, social service, and leadership), after which they’ll participate in peer mentoring, assist with suicide watch, help reduce gang affiliation and violence, and foster hope in the OSCI from the inside out.